Reference: Extracts from The Glories of Mary by St. Alphonsus de Liguori. Our Lord Jesus Christ revealed to Blessed Veronica of Binasco, that He is more pleased in seeing His Mother compassionated than Himself. He said to her: “My daughter, tears shed for My Passion are dear to Me; but as I loved My Mother Mary with an immense love, the meditation on the torments which She endured at My death is even more agreeable to Me.” Therefore the graces promised by Jesus to those who are devoted to the sorrows of Mary are very great. Pelbart relates that it was revealed to St. Elizabeth, that after the Assumption of the Blessed Virgin into Heaven, St. John the Evangelist desired to see Her again. The favor was granted to him; and Mary appeared to him accompanied by Her Son. The saint then heard Mary ask Jesus to grant some special grace to all those who are devoted to Her Sorrows. Our Lord promised Her four principal ones: first, that those who before death invoke the divine Mother in the name of Her Sorrows will obtain true repentance of all their sins; second, that He will protect all who have this devotion in their tribulations, and will protect them especially at the hour of death; third, that He will impress on their minds the remembrance of His Passion, and will reward them in Heaven for their devotion; fourth, that He will place such devout servants in Mary’s hands to do with them as She wishes and to obtain for them all the graces She desires. In the Temple, St. Simeon had received the Divine Child in his arms and predicted that this Child would be a sign (of God) which shall be contradicted by men. “Behold this Child is set … for a sign which shall be contradicted. And Thy own soul a sword shall pierce” (Lk. 2:34-35). The Blessed Virgin told St. Matilda that when St. Simeon pronounced these words “all Her joy was changed into sorrow.” For, as was revealed to St. Teresa, although the Blessed Mother already knew that the life of Her Son would be sacrificed for the salvation of the world, She then learned more distinctly and in greater detail what sufferings and what a cruel death awaited Him. She knew that He would be persecuted and opposed in every way. He would be opposed in His teaching: instead of being believed, He would be called a blasphemer for claiming to be the Son of God. The reprobate Caiphas was to say: “He hath blasphemed … He is guilty of death” (Mt. 26:65-66). He would be opposed in His reputation: for though He was of noble, even of royal descent, He was despised as a peasant: “Is not this the carpenter’s son?” (Mt. 13:55). “Is not this the carpenter, the son of Mary?” (Mk. 6:3). He was Wisdom itself, and was treated as ignorant: “How doth this man know letters, having never learned?” (Jn. 7:15). As a false prophet: “And they blindfolded Him, and smote His face … saying: Prophesy, who is it that struck Thee?” (Lk. 22:64). He was treated as a madman: “He is mad, why hear you him?” (Jn. 10:20). As a drunkard, a glutton, and a friend of sinners: “Behold a man that is a glutton, and a drinker of wine, a friend of publicans and sinners” (Lk. 7:34). As a sorcerer: “By the prince of devils he casteth out devils”(Mt. 9:34). As a heretic and one possessed by the evil spirit: “Do not we say well that Thou art a Samaritan, and hast a devil?” (Jn. 8:48). In short, Jesus was considered so notoriously wicked that, as the Jews said to Pilate, no trial was necessary to condemn Him. “If He were not a malefactor, we would not have delivered Him up to thee” (Jn. 18:30). Verse: My Mother! share Thy grief with me, and let me bear Thee company to mourn Thy Jesus’ death with Thee. Having heard that the long-awaited Messiah had been born, Herod foolishly feared that He would deprive him of his kingdom. Herod waited to hear from the holy Magi where the young King was born, and planned to take His life. When he found he had been deceived, he ordered all the infants in the neighborhood of Bethlehem to be put to death. It was at that time that the angel appeared in a dream to St. Joseph and told him: “Arise, and take the Child and His Mother, and flee into Egypt” (Mt. 2:13). No sooner is Jesus born than He is persecuted. Mary began to realize that Simeon’s prophecy regarding Her Son was beginning to be fulfilled. 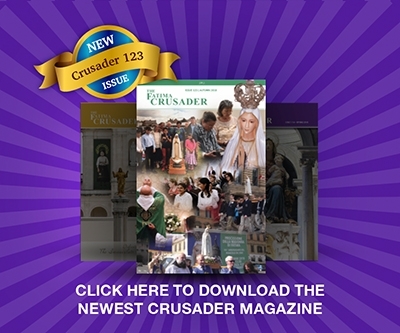 What anguish the realization of the impending exile must have caused Mary. It is easy to imagine that Mary must have suffered on the journey. The distance to Egypt was considerable: three hundred miles, requiring a journey of up to thirty days. The road was rough, unknown and little travelled. It was winter time, so that they had to make their way through snow, rain and wind, over rough and dirty roads. Where could they have slept on such a journey, especially on the two hundred miles of desert? They lived in Egypt seven years. They were strangers — unknown, without money, and barely able to support themselves by the work of their hands. Landolph of Saxony has written (and let this be a consolation to the poor) that Mary lived there in such poverty that there were times when She did not have even a crust of bread to give Her Son when He was hungry. The thought of Jesus and Mary wandering as fugitives through a strange land teaches us that we must also live as pilgrims here below, detached from the material things that the world offers, and which we must soon leave to enter eternity. It also teaches us to embrace crosses, for we cannot live in this world without them. Let us make Mary happy by welcoming Her Son into our hearts, the Son whom men still continue to persecute by their sins. The third sorrow was one of the greatest that Mary had to endure in Her life, the loss of Her Son in the temple. Having lost Her Son for three days, She was deprived of His most sweet presence. What anxiety this broken-hearted Mother must have felt during those three days when She searched everywhere for Her Son, and asked for Him as the spouse did in the Canticles: Have you seen him, whom my soul loveth? (Cant. 3:3). 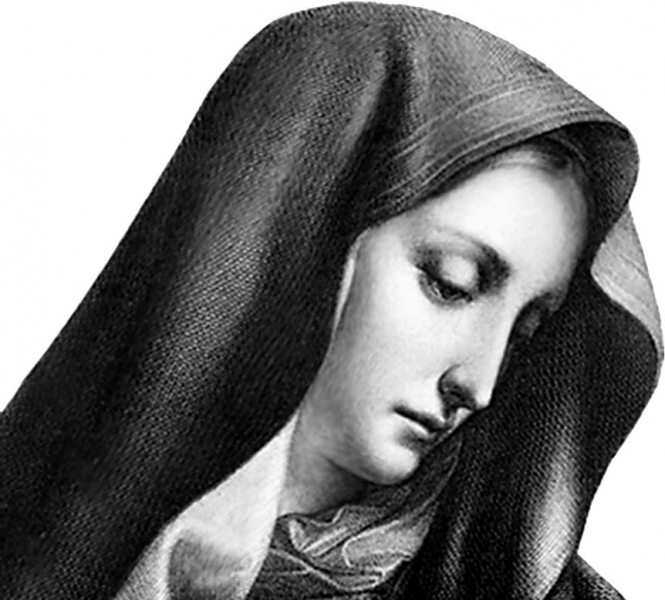 This third sorrow of Mary ought to serve in the first place as a consolation to souls who are desolate, and who no longer enjoy, as they once enjoyed, the sweet presence of the Lord. They may weep, but they should weep confidently, just as Mary wept over the loss of Her Son. But whoever wants to find Jesus must look for Him as Mary did, not amid the pleasures and delights of the world, but amid crosses and mortifications. “We sought Thee sorrowing,” Mary said to Her Son. Let us learn then from Mary, to seek Jesus. Moreover, we should look for no other good in this world than Jesus. St. Augustine says that Job “had lost what God had given him, but not God Himself.” If Mary wept over the loss of Her Son for three days, how much more should sinners weep who have lost sanctifying grace. To them God says: “You are not My people, and I will not be yours” (Os. 1:9). For this is the effect of sin: it separates the soul from God. “Your iniquities have divided between you and your God” (Isa. 59:2). Sinners may possess all the wealth in the world, but inasmuch as they have lost God, everything in this world becomes a source of affliction to them, as Solomon confessed: “Behold all is vanity, and vexation of spirit” (Eccles. 1:14). The greater Her love for Him, the greater Her grief at the sight of His sufferings, especially when She met Him on that dolorous way, dragging His cross to the place of execution. This is the fourth sorrow on which we have to meditate. “O sorrowful Mother,” exclaimed St. John, “Your Son has now been condemned to death; He has already set out on the road to Calvary, carrying His own cross. Come, if You desire to see Him and say farewell to Him, as He passes through the streets.” Mary goes along with St. John. While She waited for Her Son to come along, how much must She have heard said by the Jews (who soon recognized Her), against Her beloved Son, and perhaps even mockery against Herself. What a frightening picture as the nails, the hammers, the ropes and all the fatal instruments that were to put an end to Her Son’s life were paraded by. But now the implements, the executioners, have all passed by. Mary raised Her eyes, and saw, O God!, a young man all covered with blood and wounds from head to foot, a wreath of thorns on His head, and carrying two heavy beams on His shoulders. She gazed at Him, but hardly recognized Him. The wounds, the bruises, and the clotted blood gave Him the appearance of a leper, so that He could no longer be recognized. According to St. Bridget, Jesus wiped away the clotted blood which prevented Him from seeing Mary. The Mother and the Son looked at each other. And their looks became as so many arrows to pierce those hearts which loved each other so tenderly. Even though the sight of Her dying Son was to cost Her such bitter sorrow, Mary would not leave Him. The Mother also took up Her cross and followed Him, to be crucified along with Him. Let us pity Her, and accompany Her and Her Son by patiently carrying the cross Our Lord imposes on us. “There stood by the cross of Jesus, His Mother” (Jn. 19:25). St. John did not feel it necessary to say more than these words with reference to the martyrdom of Mary. Picture Her now at the foot of the cross beside Her dying Son, and then ask yourself if there can ever be sorrow like Her sorrow. Remain for a while on Calvary and consider the fifth sword which transfixed the heart of Mary — the death of Jesus. 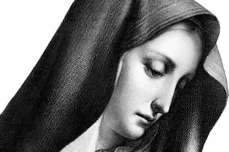 We must now consider the sixth sorrow which weighed upon the heart of Our Blessed Lady. On this day, You will be wounded with another sword of sorrow. A cruel lance will pierce the side of Your dead Son, and You will receive Him in Your arms after He has been taken down from the cross. Mary’s sufferings were so great that it was only through the miraculous intervention of God that She did not die. When She suffered before, She at least had Her Son to pity Her; but now She had no Son to commiserate with Her. Jesus was taken down from the cross, the afflicted Mother waiting with outstretched arms to take Her beloved Son. She embraced Him and then sat down at the foot of the cross. Her Son died for men, men still continue to torture and crucify Him by their sins. Let us resolve not to torment our sorrowful Mother any longer. And if we have saddened Her in the past by our sins, let us now do what She wants us to do. Let us meditate now on Mary’s last sword of sorrow. She has witnessed the death of Her Son on the cross. She has embraced His lifeless body for the last time. Now She has to leave Him in the tomb. O God, at whose Passion, according to the prophecy of Simeon, a sword of sorrow did pierce through the most sweet soul of the glorious Virgin and Mother Mary; grant that we, who commemorate and reverence Her sorrows, may experience the blessed effect of Thy Passion, Who livest and reignest world without end. Amen. Three Hail Mary’s in honor of the tears shed by Our Lady in Her Sorrows.